And if you enjoyed that journey through and time, please join us on Tuesday, September 4th, 2012, for our Chicago Post-Worldcon Science Fiction Spectacular featuring Daryl Gregory, Rae Carson, Rajan Khanna, Gregory A. Wilson, and Adam Rakunas. You won't want to miss it! Every episode of Tuesday Funk at Hopleaf seems to feature some emergent, unintended theme, and Tuesday night's show was no exception. The major theme seemed to be old men, with subthemes of brown liquor and Martian exploration. But let's not get ahead of ourselves. Jesse Jordan kicked things off for us with an intriguing and somewhat painful excerpt from his new novel Gospel Hollow. Chicago Magazine's Scott Smith followed that up with a wonderful meditation on growing old, setting the evening's themes in motion (see video below), after which Holly McDowell brought us a poignant and thrilling chapter from her serial novel King Solomon's Wives. After a break for beer, co-host William Shunn broke with tradition by reading not a poem but instead a brief essay about Curiosity Rover. 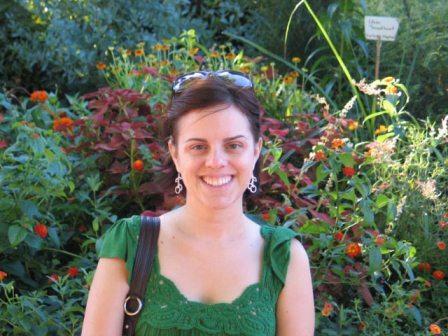 Next, co-host Sara Ross Witt delivered a powerful short story about a factory town in decline. And Stacy Bierlein brought the old man theme full circle with a wonderfully steamy story from her new collection A Vacation on the Island of Ex-Boyfriends. But if you missed out, don't despair. We'll be bringing you more video from the evening over the next few weeks, and then we'll be back on September 4th with our Chicago Post-Worldcon Science Fiction Spectacular featuring Daryl Gregory, Rae Carson, Rajan Khanna, Gregory A. Wilson, and Adam Rakunas. Be sure to join us! Reminder: Tuesday Funk #47 is tonight! For our 47th amazing episode tonight at Hopleaf, your friends at Tuesday Funk are bringing you layer upon layer of the best writers Chicago has to offer. This stellar evening will feature Scott Smith, Holly McDowell, Jesse Jordan, Sara Ross Witt, A Vacation on the Island of Ex-Boyfriends author Stacy Bierlein, and one of our patented Poems By Bill. So "like" us today on Facebook, grab one of dozens of varieties of beer from the bar, and get set for an evening of entertaining and provocative live literature with your hosts Sara Ross Witt and William Shunn. You'll be glad you leveled up. 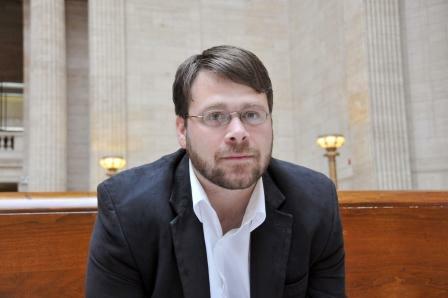 Jesse Jordan is a writer and editor currently living in the suburbs of Chicago. He is an MFA graduate of Columbia College and a member of Reading Under the Influence (a monthly series which you can see tonight at Sheffield's). Gospel Hollow is his first novel. 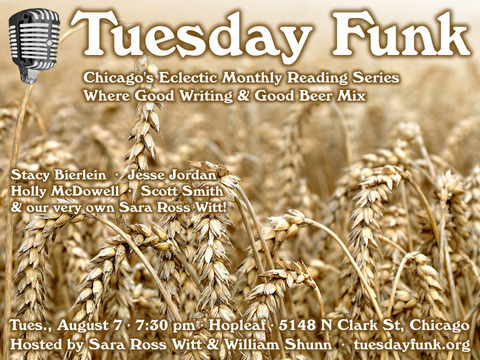 Please join Jesse and the rest of our crew of excellent readers in the upstairs lounge at Hopleaf on August 7th. The fun gets underway at 7:30 pm. This page is an archive of recent entries in the Reading # 47 category. Reading # 46 is the previous category. Reading # 48 is the next category.